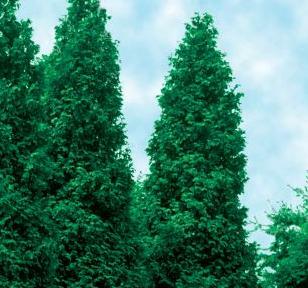 Arborvitae ‘Green Giant’s are the fastest growing evergreen trees available – they will climb as much as three feet in a single season, growing faster than similar varieties of Leyland Cypress and Hemlock, and Green Giant creates a much fuller barrier when used as a privacy fence or wind screen. It is extremely hardy, drought tolerant, and more deer resistant than other fur trees. The needles stay deep green year round, providing a soft, solid backdrop for colorful garden designs. It is a great match for Acers and Cherry trees, if you are interested in Japanese gardens. Arborvitae Green Giant is the perfect first step to your own private backyard oasis.